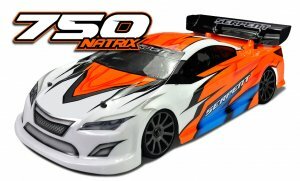 Serpent Natrix 750 1/10 scale 4wd gaspowered 200mm car 4wd, belt-drive, gear-differentials front and rear, Centax TM clutch, 2-speed gearbox, 75cc tank, chassis 7075-T6, carbon radioplate and shocktowers, RCM-SS shocks, ball-raced anti-roll bars, fully adjustable. The 2mm carbon fibre radioplate has multiple functions. It holds the fueltank in place which is mounted on 3 alu posts in rubber. On the left hand side the receiver and right side the battery mounts to a nicely shaped carbon fibre plate that connects to the radiotray, sqeezed in right between belt and tank. The radioplate sits again lower on the car , for lower center of gravity. New features include the possibility to mount a second belt tensioner and improved accessability and flex control through a new way of fixing the servosaver. The spring-steel wheelaxles are seated in high speed bearings. The light and durable spring-steel cvd’s bring all the power to the front and rear wheels. Wheels are mounted to orange anodised high grade aluminium hex-adaptors using flanged wheelnuts. EFRA GP Series RD2 is finished! Unfortunately again not the result we wanted. Qualifying 7th in a field of great drivers I was happy with because I was satisfied especially with our race pace for the finals. 09/22/2018 Dominic Greiner is Top Qualifier for the final round of the ENS series. 09/21/2018 Serpent Natrix 750 is now available. Thank you for subscribing to the newsletter! We hope you enjoy shopping at Serpent Ltd.
© 2018 - 2019 Serpent Ltd.. All rights reserved.